I never thought I'd ever hear myself utter such words post-1995. But after Monday's reveal of the Surface tablet—complete with an ultra-thin, pressure-sensitive keyboard cover and the most discreet integrated kickstand ever—and today's Windows Phone 8 announcement—which will be based on the same underpinnings as the Windows RT part of Windows 8—I'm a believer that Microsoft is the most innovative consumer tech company right now. And it isn't just this week's announcements that did it. This has been building all year. 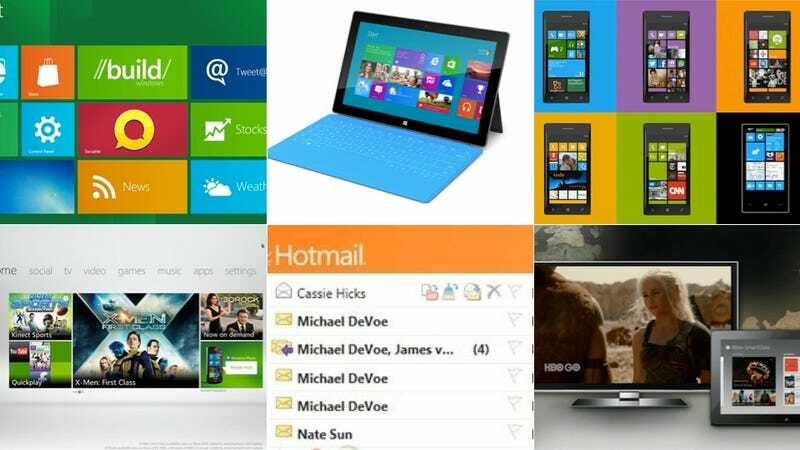 There's Windows 8, Xbox Live, Skydrive, Kinect, SmartGlass; even Hotmail stepped up its game. The Surface, and now Windows Phone 8, merely feel like the culmination—or maybe the fulfillment—of what Microsoft has been poking and prodding at for the past six years when it first introduced the Xbox 360. Microsoft is a company reborn. It's not just significant because of past achievements. Microsoft is exciting again because of what it's doing right now. When I first laid hands on Windows 8 and slid my fingers across the Metro interface in February, it all felt too good to be true. Smooth, fast, intuitive. I liked Windows 7 and its new features just fine, but it was just another rung on the same tired old ladder. Windows 8? Totally new. Microsoft used to be content with functioning as the backbone of corporate America in the 90s, bringing us such wonderful abominations as Internet Explorer 6, Outlook, Windows Mobile, and, of course, Windows Vista (which was more annoying than terrible). Sure, those products had every feature under the sun, but each required a PhD to use fully. But somewhere between the launch of the Xbox 360 and the release of Vista, Microsoft started to approach design—industrial, UI and UX—with genuine interest, instead of treating it as an obligation. The first real evidence of this shift presented itself—believe it or not—in the form of the Zune. It was better than the iPod classic. Much better. Sadly it was stuck fighting a battle that nobody at time could have won, in a product category that was already well on its way to irrelevance. But its swan song, the Zune HD, offered a glimpse of hope that Microsoft could deliver a mobile experience to rival that of Apple. And with Windows Phone 7, it did just that. These products led to the biggest evolution inside Microsoft: creating a unified, consistent design—and now, programming—language across all their consumer-facing products. You notice this right away with Windows Phone, Windows 8, and most recently, Xbox, each a gorgeous panoply of animated live tiles thick with information. But that DNA is also present in other products, even boring ones like Office. The beautiful tiled homescreens, the seamless, yet multi-paned, app interfaces. The little things, like transitional animations. It all adds up to something inviting. No scratch that, it's damn near seductive. Looks aside, there's the feeling that this change is coming from a new core philosophy and not just blind trend-chasing by a pack of suits. Microsoft is embracing ideas as much as statistics. In the past, the company stuck to empirical data for its decision making. It was stubborn so as not to alienate its primary user base, and its attempts to implement new concepts resulted in ghastly creations better suited for a Mary Shelly novel. Today, however, there's a certain nimbleness to the company. Sure, it still believes in the power of user research, but it has stopped trying to cram as many features and functions as it possibly can into every screen and menu. It has started evaluating what information is actually important, and how to make accessing that info as easy as possible. It is willing to revamp and redesign if something isn't working. The tough decision to rework the underlying code of Windows Phone—making all existing phones unable to be updated—is a shining example of the new Microsoft. Redmond's willing to implement unpopular, slightly disruptive features for a better long-term future. Even more crucially, Microsoft has been improving on existing ideas, rather than just making competent facsimiles. SmartGlass is AirPlay without the fiercely guarded ecosystem. Windows Phone 8's Wallet looks like the precocious lovechild of Google Wallet and Apple's Passbook. The keyboard cover on Surface may have finally cracked the tablet input puzzle. Is it possible that Microsoft hits a wall and falls just short of excellence? Absolutely. Windows Phone is still in dire need of apps, and we're still only playing with an incomplete version of Windows 8. The Metro UI will serve as the foundation of Windows in the future, but for now it's mostly just a top layer on Windows 8's more conventional underpinnings. Surface might be the most exciting new hardware of the year, but there's no way around the fact that it's two years behind the iPad. And the prominent spec schism between its two models shows that Microsoft still can't resist the allure of trying to appease every customer it possibly can. And let us not forget the Kin. But for the first time in a long time, I at least have faith that Microsoft can get it right. That's more than I can say for most companies.